– In a small jar with a lid, combine garlic, lemon juice, olive oil and herbs. Season and shake vigorously to create an emulsion. Set aside. — In a small saucepan, combine capers and olive oil. Fry for 2 to 3 minutes on medium heat or until capers break (be careful with splashes). Remove the capers from the pan and place them on a paper towel. Set aside. — Wash the fish and dry it well. Cut 3 incisions on each side of the fish and place it on a baking sheet lined with parchment paper. Using 1/3 of the emulsion, moisten the inside as well as the outside of the fish, making sure that it seeps into the incisions. —Bake on the centre rack of the oven for 20 minutes. Delicately turn the fish over and pour on 1/3 of the emulsion. Bake for another 15 minutes. 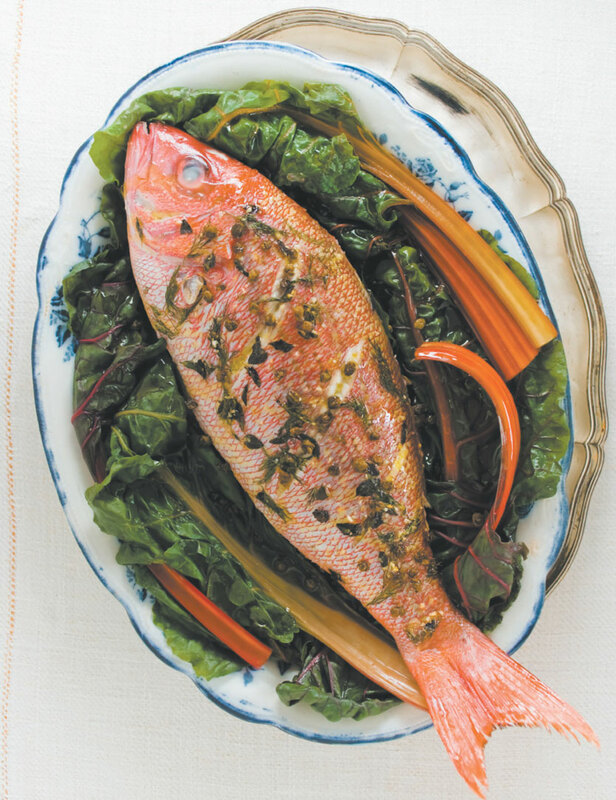 FINALE — On a platter garnished with swiss chard, place the fish with the capers and lemon wedges. When ready to serve, sprinkle with fleur de sel and fresh ground black Use the last 1/3 of the emulsion as a sauce. NOTE — Traditionally the fish is served in a very convivial way in the middle of the table for everyone to help themselves. All recipes in this book complement each other; use your imagination to create your own side dish combination: beet salad, sautéed rapinis and homemade fries. The choice is yours!